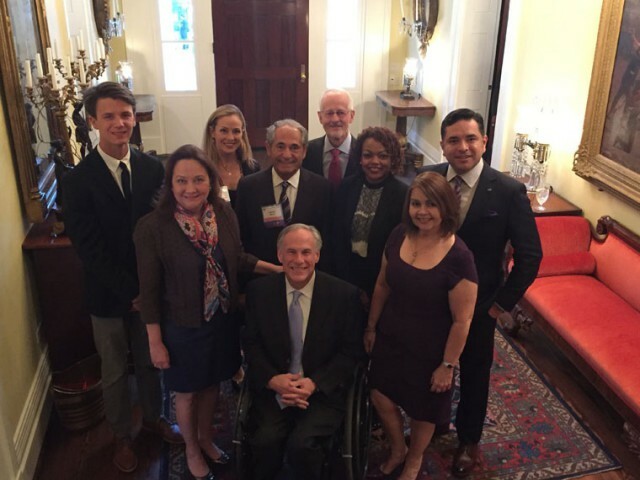 First Lady Cecilia Abbott, Honorary Chair of the 2016 Governor’s Volunteer Awards, and Governor Greg Abbott hosted a reception at the Governor’s Mansion honoring the eleven winners of the 2016 Governor’s Volunteer Awards. In their 33rd year, the awards - presented in conjunction with the OneStar Foundation - honor the extraordinary service of individuals and organizations in Texas that have made a difference in their communities through service and volunteering. In 1999, Dennis Cavner helped to create a “Founder's Circle” of individuals who pledged $9 million of social venture capital to launch an organization that is today recognized around the world as LIVESTRONG. Dennis believes in engaged philanthropy and social innovation and has served as Board Chair of LIVESTRONG, College Forward and Mission Capital. An inspiring and visionary leader, Dennis embodies a strong philanthropic spirit that inspires others to serve. After losing his mother to a battle with cancer in 2014, Taylor decided to honor her by building a home in her name through Austin Habitat for Humanity. Taylor woke up early every Saturday for 16 weeks to build a home that would benefit a low-income family and create a lasting legacy to his mother, an architect and volunteer with Habitat for Humanity. Taylor raised the $85,000 necessary to build the "In Memory of Maureen" home, volunteered 120 hours, and inspired over 600 others – ages 17 to 70 – to volunteer as well. For over twenty years, Literacy First (formerly ACE: A Community for Education) has provided one-on-one tutoring to low-income Austin ISD students in Kindergarten through Second Grade to “advance students to grade level in reading by third grade.” Literacy First accomplishes this by providing 150,000 hours of bilingual, research-based early literacy tutoring and instruction to 2,200 students each year. At least seventy-five percent of tutored students finish their year either at grade level or having made significant, measurable progress in their reading skills. In 2007, Prince Humphries returned from his second deployment in Afghanistan disabled and withdrawn. Seeking solutions, his wife LaTronda began working with military populations as a family coach and mentor. LaTronda eventually founded Healing our Heroes Project, a non-profit organization that provides therapeutic retreats for veterans and their families. The retreats help them withstand the pressures of military life and thrive in civilian communities, and are provided at no cost to the service members and their families. Texas Christian University has successfully integrated scholarship with citizenship and service as evidenced by the Office for Community Engagement. In 2015, approximately 6,700 students participated in service projects sponsored by the department, affiliated student organizations, and service-learning courses. For more than 80 years, thousands of Blue Corps® employee volunteers have lived, worked, and volunteered in their communities, and earn matching grants for the organizations they serve through the number of hours volunteered in and outside of work. For each hour an employee gives to a Community Partner, the company donates $20 to $2,000 per year. In 2015 alone, more than 1,875 Blue Corps® employees donated 33,021 personal volunteer hours to 83 statewide community partners, which received $101,380 in matching dollars. Carmelo Mauro, founder of Carmelo’s Ristorante Italiano, is known throughout Texas for his generosity in donating time and funds in support of numerous causes. Perhaps his most notable accomplishment was creating and establishing a pilot program in entrepreneurship in Del Valle High School in Austin. Carmelo did this by transforming classroom space at the high school into a real restaurant, and approximately 5,200 students have gone through the Del Valle program since 2001. In 2006, the Medical Center of the Americas Foundation was created in response to a shared vision to develop a “center for excellence in healthcare education, research and services in the Paso del Norte region.” A team of universities, healthcare professionals, researchers, business and community leaders have invested thousands of volunteer hours and leveraged their skills and knowledge to successfully launch a biomedical industry in El Paso. Medical Center of the Americas Foundation has become a change agent for the El Paso region, serving as an icon for the emerging biomedical industry and a model of innovation. The Spring Branch Family Development Center coordinates a multi-agency collaborative, providing educational, recreational, health and social services in English and Spanish. Opening in 2001, the Center serves over 12,000 people annually and provides low-income families with one-stop access to many holistic tools to help them succeed. Over the past eleven years, the Center has hosted an annual Back-to-School Health Fair that has enabled 45,000 community members to receive over $2.75 million worth of services by providing free immunizations to 5,000 children and distributing 25,000 backpacks with school supplies. The Bastrop County Long Term Recovery Team was born in 2011 after the most destructive wildfire in Texas history. In the four years following the fire, the Team provided case management and coordinated thousands of volunteers who cleaned up debris and rebuilt 133 homes. Disaster struck again in Bastrop County in 2015, and the Team was there to help, providing shelter and food while coordinating hundreds of volunteers. The Bastrop County Long Term Recovery Team has also assisted in the formation and operation of other Long Term Recovery Organizations in Texas as well as in other states across the country. Brenda Gormley has been a volunteer with the Community Emergency Response Team (CERT) for 15 years, and became a CERT Master Instructor in 2010. For many years, Brenda logged over 40 hours per week as a full-time volunteer CERT Coordinator and Master Instructor. She has also trained over 2,000 Denton County volunteers, from ages nine to ninety, to assist local law enforcement in wide area search and rescue, crime scene preservation, and sheltering animals during disaster. Brenda is also a Senior Corps member through RSVP: Serving Denton County. She has received awards for her dedicated service from the Federal Emergency Management Agency and the Texas Division of Emergency Management.